I’m sure you’ll agree that a cordless phone should have a strong transmission distance, long battery life, and multiple features to be something to talk about. That was our top criteria for selecting the best cordless phone. 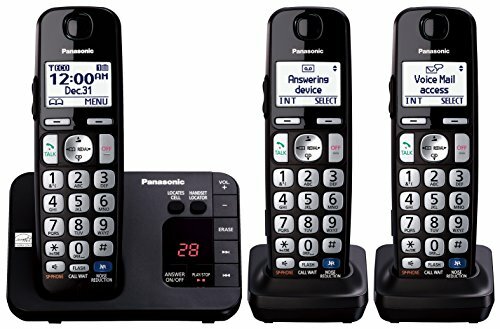 If you want to cut to the chase the Panasonic’s Expandable Digital Cordless Answering System scored high marks in all of these categories and is our top pick. Cordless phones are common place in almost every home that has a landline. They are convenient, comfortable and much more freeing than using the traditional corded phones. There are so many different styles, types and price points available when it comes to cordless phones that figuring out the one that will be the best fit for you can be a little daunting. What your own needs are when it comes to a cordless phone, is important so you can choose the one that will provide what you need. We have studied the market and researched the top brands to find the best cordless phones for you, including the best and most popular features that consumers find important and helpful in their daily lives. The following cordless phones are the top ranked cordless phones on the market and are regularly consumer favorites. We’ll show you why and you can decide on the one that will meet your needs and provide the features you are looking for as well. There are a lot of things about this cordless phone that consumers like. For starters it is an Amplified Expandable Digital Cordless Answering system so you don’t just get cordless phones; you get an answering machine as well. The extra large buttons are easy to push and see and the amplified volume with separate volume key is very good for those who may have vision or hearing difficulties. The enhanced noise reduction is a favorite feature that allows the user to be heard much easier even when they are calling from a noisy location. Another unusual feature is the tone equalizer that allows you to adjust bass, mid range and treble tones in the caller’s voice for the best sounding phone call. 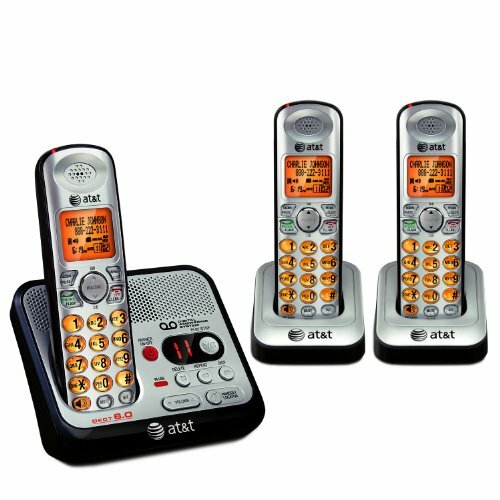 This system comes with three handsets which makes it the perfect cordless phone system to get for a larger home. No need to hunt down one handset; keep one in the living room, one in the kitchen and one in the bedroom so the phone is always accessible. Another plus to this top ranked cordless phone answering system is that it has a strong battery backup so even if the power goes out you don’t lose your ability to call out in the event of an emergency. The long range is great for those who like to talk on the phone out in their yard or garden. The answering system is all-digital and user friendly with good instructions included so the user gets to know what the phone’s capabilities are. Not only does this AT&T cordless phone with answering system look great it has tons of features that make it a very useful phone system to have. It has three handsets that hook up with just one jack, which make it great for larger homes. Out one phone in the den, one in the kitchen and even keep one in the garage. It also has handset speakerphones, a digital answering machine system and excellent sound quality, range and security. Other important features like Caller ID and Call waiting helps ensure that the user doesn’t miss any important phone calls that they are waiting for. One feature that is a favorite with users is the intercom system which makes it possible to talk to people in other rooms without having to shout. The lighted keypad and display is easy to read even when the lights are dim. You also get 14 minutes of recording time on the answering system when people call and you’re not available to answer the phone so even when you’re not home, you don’t have to miss a call. You can conveniently use the handset, the base or call from any cell phone to retrieve your messages. Mount the phone on the wall or just set on a table, depending on the amount of space you have to work with. This Panasonic Bluetooth enabled phone system, provides the same great quality that consumers have come to expect from this brand. You can expand this system to include up to six handsets which is great for when you need phones in multiple rooms but don’t have multiple jacks available. With the Link2Cell capabilities you can make and receive calls on your cell phones without worrying about dropped calls. You can integrate your cell phone into these systems even more by transferring your cell phone contact list to your phone base and set specific rings to sound to differentiate one cell phone from another from the landline. You additionally get a great answering system with the Panasonic Link2Cell System as well that provides about 18 minutes of recording time and will automatically transfer your messages to your cell phone or office so you never miss an important message. You will love the sleek look of this cordless phone system. The silver base and silver and black handsets will be neutral enough for any home’s décor. The phone’s features are easy to use and offer many benefits to the users, especially the way cell phones can be integrated into the phone systems. It is a cordless phone system with an answering machine that you will get a lot of use from and enjoy having in your home. The cordless phone sets reviewed are all great products that will provide you with an answering system and many helpful features that help you stay connected and not miss those important calls. Customers are raving about these cordless phones for many different reasons but they are all customer favorites and one of the things that is common between all of them is that they provide good sound quality and functional features that you will actually use. If you’ve ever used a cordless phone with poor quality you will know what it’s like to have something far superior once you try one of these great systems. 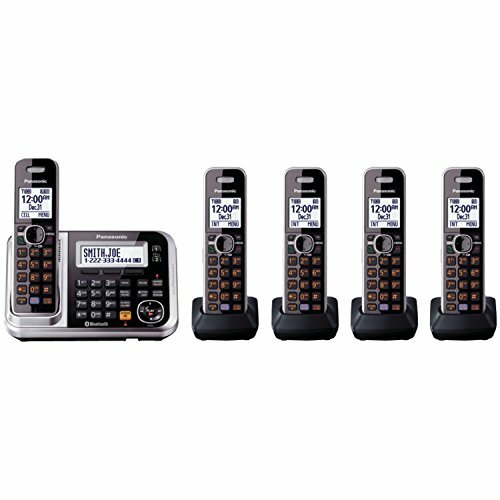 All three of these top ranked cordless phone systems come with multiple handsets which makes them much more practical for a normal busy household that has several rooms and maybe even multiple floors. What is a Cordless Phone? Cordless phones really gained popularity in the 90s and they have replaced the majority of traditional corded phones in most homes. While offices still use corded phone systems, most people like the freedom cordless phones afford them and like having them in their homes so they are not tethered to the wall. They are especially helpful for people who like to be outdoors in their yards, garages or gardens and can prevent the user from missing important calls since a cordless phone can be carried outside a certain distance and not lose reception or sound quality. The technology of a cordless is fairly straightforward. It has a handset that is powered by a battery that communicates with the phone base that is plugged into the wall and a phone jack. The FCC (Federal Communications Commission) has set aside 7 frequency bands that can be used for cordless phones from 1.7 MHz to 5.8 GHz; most of the cordless phones on the market use about 900 MHz bands or higher. House phones are not as common in homes as they used to be with the increasing cell phone craze that has been around for years but there are still a lot of benefits to having a landline in your home. Voice quality for both talking and hearing with cordless phones has been tested and found to be much better than even the best cell phones, and they also provide better security in the event you ever need to call 911. A cordless phone system makes having a landline more convenient than ever. Many have multiple handsets that only require one phone jack and then additional outlets to use. You can place the handsets in different rooms and not have to go running for the ONE handset you have in another part of the house. When it comes to buying a cordless phone system, there are a few things that you will need to know the answers to before you start comparison shopping. These are not difficult things to answer by any means, but they will help you narrow down your choices and determine which type of cordless phone system will be the best for your family’s needs. How many phones do you want? – Consumers used to have to purchase one cordless phone at a time. If you wanted more than one phone in your home you had to buy 2 or 3 separate phones and plug each one into a separate phone jack but that is not the case anymore. Many of the cordless phone systems have the capability to have 2, 3 and even 6 handsets that all work from the same base. You only need one phone jack and then there are separate handsets that you place in the rooms you need them in. All you need is a regular outlet to power the handset and you’re good to go. This ability to have several handsets makes the days of hunting for the ONE cordless phone that was lost in the couch somewhere a thing of the past. Do you want an integrated answering machine or a separate, stand alone one?- Some of the more advanced cordless phone systems have answering machines that are a part of the cordless phone system itself. The answering system’s controls are in the main base of the phone. There are many benefits to having integrated answering systems but that is a personal choice that may differ from consumer to consumer. Do you Work at Home? – Having a home office can mean needing a higher quality cordless phone system that has excellent sound quality and reliable battery life. If you NEED your phone system to be top notch, the top ranked ones we reviews here are all great choices that will work well as both a regular house phone AND an office phone. What Features are Important to you? – Caller ID, Call Waiting. Call Forwarding, Cell phone integration…all of these are features of some cordless phone systems. What kind of features are you going to need your cordless phone system to have? Make sure that the model you choose includes the features that you truly need and want so you are satisfied with your purchase. There are some common features that tend to be fairly standard when it comes to cordless phone systems. Others may only be offered with some of the higher end models. We have outlined below, many of the features that you can get with certain cordless phones so you can narrow down the ones that are important to you. LCD Display Screen – Most handsets have a screen that displays a variety of information such as the name of the caller, the number being called from, the time, battery strength, whether you have messages or not, the last number you dialed and information about the call you’re on, including how long you have been talking to that person. If you have Caller ID with Call waiting, you can also get dialer information on who is calling in while you’re on the phone with someone else. Support for Two Phone Lines – This is perfect for those who work from home or for roommates. Two line capability means that two different phone numbers can work on the same phone. In most cases each line has its own separate ring so the people can tell whose call it is or whether it is a business call or house call. Two line featured phone systems also work to handle conferencing calls between two separate callers and the user. Speakerphone – Speakerphones are a great way to converse with the caller without having to use the handset. Click the speakerphone and you can talk on the phone while cooking, washing dishes or tending to your children. It’s also a great way to allow several people in the room to talk to the caller at once. The speakerphone feature allows for hands-free talking anywhere you are in the house as long as you have the handset nearby. Keypad on the base – Some cordless phone systems have a keypad on the base and not just the handset. This feature is really handy if you need to scroll through some of the phone’s information while you are in a call. These keypads are usually lighted so you can view them easily no matter what the light conditions are. Some bases have ringer controls and volume controls as well. Headset Jack – This feature is very handy if you work at home and do webinars, conference calls or even transcription where you need to have your hands free to type while you are listening to the call. They can also be useful for moving around the house if you want to do other things while you’re talking and have a belt clip that you can clip to your pants as you talk and go about your day. Headsets for these jacks are not usually expensive at all, just be sure that the jack is the right size for your phone. Battery Backup – This is probably one of the most popular features you can get for your phone and also one of the most important. Cordless phone systems can stop working if your power goes out, but with a battery backup feature your phone will continue to work even if you lose AC power. Regardless of the battery backup feature, it is always a good idea to have a regular corded phone in a safe place where you know where it is in the event of a power outage and the cordless phones don’t work. This way you can plug the corded phone during the outage and still have access to emergency personnel if you need it. Caller ID – Caller ID is a very popular and much used feature that allows users to know who is calling them and in most cases the number they are calling from. Some units will have a voice announcement; others just simply flash the information on the LCD screen. Call Waiting – This feature is very useful if you are currently on a call but are expecting another one. It is very beneficial for those who work from home since you can be talking to one person and still get work calls rather than the old fashioned (and frustrating) busy signal that can actually cause you to lose business in many cases. Call waiting alerts you to another caller calling in with a beeping sound. You can choose to place the current call on hold and answer the first (which is done automatically when you properly switch between calls) and you can let the incoming call go to the answering system while you continue the current call you’re on. Cordless phone systems have come a long way from when they first got popular in the 90s and they continue to increase in functionality and technology every year. Most models have several features that you get and you can even choose the number of handsets you want to use with many types. Whatever your personal home phone needs are, there is a cordless phone system available that will fit them. With the information you have learned in these reviews and the buyer’s guide, you are ready to compare the different models and see which one you like the best. Don’t forget to look at things like battery life and pay attention to the reviews and comments consumers are making about the models you are interested in. We even brought you three top ranked cordless phone systems that customers love and that are all feature rich. Whichever one you choose if you have read the information here and decided ahead of time what you are looking for, you will find that phone that will be perfect for you.